The piezoelectric responses of polymers in practical use are divided into the following classes with different piezoelectric characteristics: chiral polymers (optically active polymers), ferroelectric polymers, and cellular electrets. The piezoelectricity of chiral polymers is in response to shear strain, that of a ferroelectric polymer is in response to tensile strain, and that of cellular electrets is in response to strain perpendicular to the film surface. 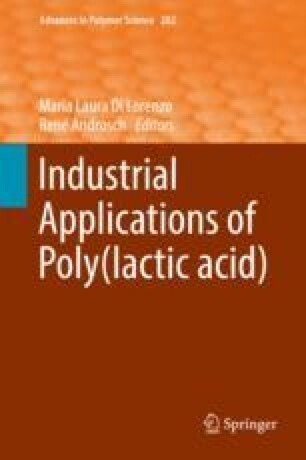 Study of the piezoelectricity of poly(l-lactic acid) (PLLA), which is a chiral polymer, has advanced in the last few decades, and its practical application to sensor devices has progressed accordingly. In this chapter, the piezoelectric characteristics of PLLA and its applications to sensor devices are systematically discussed. This work was supported in part by a Grant-in-Aid for Scientific Research from the Ministry of Education, Culture, Sports, Science and Technology, Japan. We appreciate receiving a 2016 Commendation for Science and Technology (Prizes for Science and Technology: Development) from the Minister of Education, Culture, Sports, Science and Technology, Japan.